JackLayton is a Legacy Library. Legacy libraries are the personal libraries of famous readers, entered by LibraryThing members from the Legacy Libraries group. » Jack Layton's legacy profile. JackLayton is also an author. 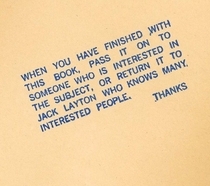 » See Jack Layton's author page. About meJohn Gilbert "Jack" Layton, PC (July 18, 1950 – August 22, 2011) was a Canadian social democratic politician and Leader of the Official Opposition. He was leader of the New Democratic Party from 2003 to 2011, and previously sat on Toronto City Council, occasionally holding the title of "Acting Mayor" or "Deputy Mayor" of Toronto during his tenure as city councillor. He was the Member of Parliament for Toronto—Danforth from 2004 until his death. About my libraryThis book collection was donated to Ryerson University by the family of Jack Layton in the fall of 2011.